Published on April 28, 2015 April 27, 2015 by Rachelle J.
It’s that time again! I’m super excited about this Bout of Books because, with the exception of two Final exams, I’ve got the whole week to read, read, read! I will be reading every day of the week whenever I’m not running errands, studying for those Finals, or spending time with the Boyfriend. finish off whatever books I’m currently reading. Read at least one new book off of my TBR shelf. I want to be able to finish at least 3 books, but I’m really hoping I’ll be able to finish 4. This list might change by May 11th, so I’ll be sure to update it. I will be updating with one post each day with the number of books I’ve read that day, the titles of the books I’ve finished, and the total number of books read. If I wasn’t able to finish a book that day, I’ll put the number of pages read instead. Yessss! So excited for another readathon. 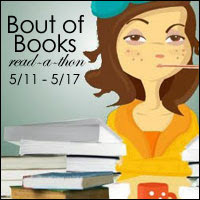 Glad you’ll be participating, and I hope it helps you finish off some of those lingering current reads! Ahh, thank you for reminding me this was coming up! I’m so excited about this Bout of Books! I haven’t participated in a while and am hoping to get out of my reading slump!